The French Club is the oldest of the CEB in the World as it was founded in 1907 in Britanny and that the official standard was passed in 1908. It is actually the most important CEB. Cradle of the breed, The standard is a French one (FCI #95) and it has evolved over 100 years, only on details. The size for example is always accepted between 46cm and 52 cm. In 1956, the standard accepted black colour in the coat. Click HERE to go to the previous web page. -You will find here all the entry forms for the various events at the National breed show. Consider the reduced prices for early bookings. As many people in the World, join the CEB and receive our magazine twice a year. Download the membership form HERE. A great opportunity to compare the qualities of épagneuls bretons in the mountains in search of the black grouse. More selective than contest on shot game. A Trophy between France, Italy, Swiss. Why not others countries ? The French CEB promote only mating and litters selected, not all litters. To be published, at least, both parents must be xrayed on hips dysplasia, rated "Excellent in special shows and succeed in the TAN (Natural Abilities Test). Cotations 3, 4, 5 and 6 are much more challenging. Since 2016/01/01, all to be rated 2, 3, 4 5 or 6 points, a dog must have DNA identification. 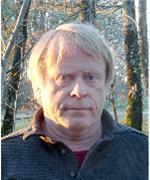 It is a guarantee against many frauds that may be encountered in some countries. Click HERE for more explanations. Each month, we publish on our website the litters rated at least 4 points, with the 2 parents xrayed A, B or C. If you wish, click HERE to go to the litters selected by the French CEB. 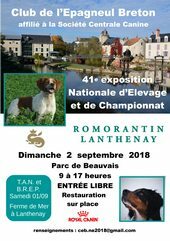 The most important show for épagneul breton in France is never the French Championship organized by SCC (The French Kennel Club) but the Nationale d'Elevage which brings together over 200 épagneuls bretons from France and others countries. Foreign fanciers of the breed are always welcome !